BOULDER'S COMMUNITY VIDCAST AND TV SHOW. 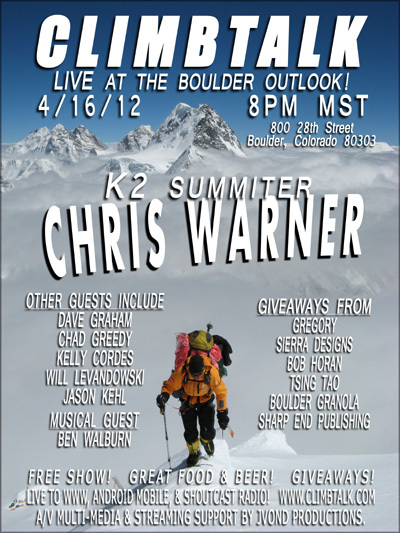 Experience the full multimedia/streaming presentation of the CLIMBTALK radio show recorded and streamed live from the Boulder Outlook on 4/16/12. All production work by JVonD Productions. PRODUCER COMMENT – This was an experimental piece which was all produced in real-time with one computer and one engineer . Unfortunately there were a few video and streaming glitches through out the show but the audio recording turned out great so all around I’m super stoked with the archive. JVonD and Mike Brooks talk about Boulder stuff. Check out scenes from the SCS comp at Movement Climbing and Fitness, the Gladiator comp at the Spot Gym, and the world record climbing attempt by Will Levandowski.